Aura is a unique set of wearable devices for expecting couples – a dress for an expecting mother and a bracelet for her partner. 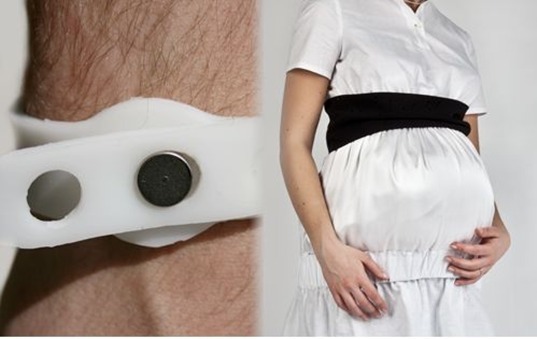 Communication between the dress and the bracelet allow mother, baby and papa-to-be connect in an unusual, but meaningful way. Designer Marco Righetto notes that while Aura may work for any expecting couple from the 25th week of pregnancy, the project was primarily based on the needs, desires and experiences of heterosexual couples. Aura from marco righetto on Vimeo. Yesterday we told you about a pregnancy suit designed to help dads-to-be or anyone who has never experienced pregnancy, to feel virtual fetal movements and kicks. This gadget however, is more about bonding for couples who are expecting. Righetto states that Aura is meant to address couples who may travel frequently. Aura works somewhat like a conversation piece between mother and father to be,transforming fetal movements into a light message for the mother-to-be and a sensation message for her partner. According to Righetto, “The simultaneous connection of the two people enhances the emotional ‘messages’ transmitted by the devices. The relationship is participatory, and the actions of both partners shape the ‘conversation’.” Aura is easier to understand if you view the video above. I think it is neat to see companies working to connect families. My husband loved getting a chance to touch my belly to feel the baby kick. Second, though I am heterosexual, I do not think it was necessary for this to be pointed out by the inventors nor inhabitits. It makes me feel that I have access to something that other may not and am being included when others are not. Which is a odd feeling. Plus, not every heterosexual couple have their own babies. So, while everyone viewing can see if a product is for them or not, it does not need to be TOLD to them. So, I would not want the product.